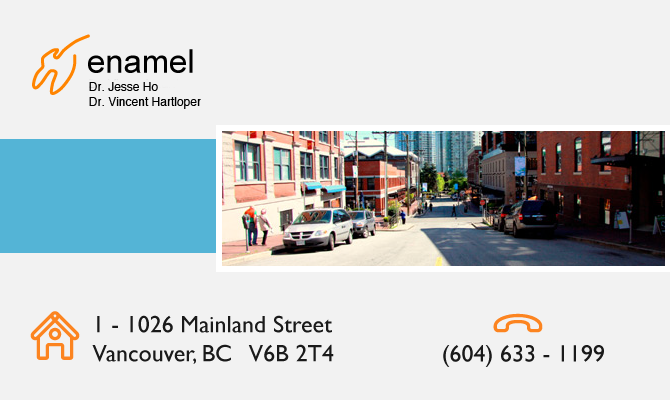 At our Yaletown dentistry, we strive to help you achieve your dental needs in a safe, comfortable, professional setting. From your first cleaning to your restorative dentistry, we have the gentle touch, the experience, and we consistently keep up-to-date on the latest in order to keep providing you the dentistry you want, and to keep your mouth in the best shape it can be. Come see why a global clientele come to us for all their dental needs – from laser-supplemented cleanings to Invisalign to porcelain veneer smile makeovers, we have all the tools to keep your mouth in shape in a comfortable environment that includes massage chairs, TV’s in each room, intra-oral cameras, digital x-rays, hand-softening treatments, and most importantly: gentle, personalized care. Dr. Jesse Ho graduated from the University of British Columbia in 2004 with a Bachelor of Science degree major in Biochemistry. He then obtained his DDS dental degree with Honours at the University of Toronto. Born in Taiwan and grew up in Hong Kong and Vancouver, Dr Ho can speak fluently in English, Mandarin and Cantonese. He is a registered member of the Canadian Dental Association and British Columbia College of Dental Surgeon. Dr Ho prefers to know his patients, rather than just “treat” them. He believes in listening to his patient’s need and concern before providing them all their treatment options. He believes dentistry doesn’t have to be scary, as he tries to delivery dental treatment with gentle chair side manner along with the options of sedation for his patients. Dr Ho practices all aspect of general dentistry. He is a certified Invisalign provider and he has taken a number of study clubs from Implant to Orthodontics. He always strives to stay current on all the latest dental knowledge in order to give his patients the best advice and treatment.